The mission of the Advanced Papermaking Initiative (API) is to enhance post-secondary education and research for the paper industry of British Columbia. The program is housed in the UBC-Pulp and Paper Centre and is governed by a Director and a Steering committee of industry stakeholders. The Director of the Program is Professor Mark Martinez (CHBE). 1. Teaching of Highly Qualified Personnel (HQP): API Faculty have developed and teach courses on papermaking at the undergraduate and graduate level. The program contributed to the training of 35 graduate students through the teaching of advanced courses in papermaking. The program contributed to the training of over 100 undergraduate students at UBC through the teaching of specialized courses in papermaking. For example, CHBE 401 ranks as one of the most popular undergraduate elective courses offered in 2007/08 with 60 students. Training of about 17 Coop students through participation in research programs. A course to University of Victoria Engineering students is taught once a year that has an average enrollment of about 12 students per year. 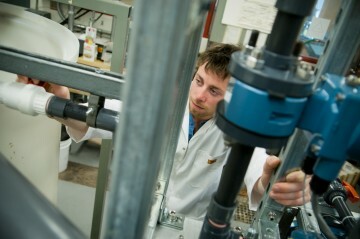 At BCIT 110, students in the Chemical Sciences Program (Pulp and Paper option) were trained. An annual introductory course is offered to newly hired engineers and Coop students in BC’s paper and allied industry’s (24 students per year). It is important to note that a number of the undergraduate student trainees have been retained by the industry and given the current demographics, the need for these engineers can only increase. 2. Research to advance papermaking engineering and to support BC Industry: Research carried out under the supervision of the API’s faculty contributes supports the industry in BC to stay competitive by contributing engineering solutions in the areas of energy efficiency and production of high-value paper. It is important to recognize that the need for engineering solutions is more acute due to the lack of capital to invest in new machinery and equipment. API faculty have established internationally recognized research programs in the area of papermaking engineering. The work has been recognized with National and Provincial awards e.g. 2008 BC Innovation Council – BCIC Lieutenant Governor’s award for Innovation; 2007 NSERC Synergy Award for partnership and innovation. The impact API’s work on the paper industry in BC has been tremendous and has been documented to result in savings of a few million dollars per year. Currently a coordinated effort to reduce direct energy consumption in the province by 20%. At a time where BC’s industry needs enhancement of its R&D efforts , it would be a step in the opposite direction if programs such as the API cease to operate. Finally, the importance of the paper industry to BC highlights further the significance of the API. More than $4 billion of annual economic benefits to British Columbia. Over 10,000 direct jobs, and 20,000 indirect jobs from the pulp and paper industry. An annual industry payroll of $1 billion, making pulp and paper the second highest paying industry in the province. $600 million per year in contributions to all three levels of government through taxes and assessments, as well as from employees in the industry. The towns where pulp and paper mills are located benefit from municipal taxes and employment, as well as the industry’s support of local activities and infrastructure. The pulp and paper industry contributes more than $1.5 billion to the solid wood sector, as the single largest customer of residual chips (by-products) from the sawmilling. Without a viable pulp and paper industry, it is impossible to have a viable forestry industry. Strong consulting, technical and associated supplier industry. 22 Facilities in 18 communities across BC. Purchase 8.3 Million megawatt hours of electricity and produces 4.3 million megawatts of green biomass.